For years, you’ve been living with an unwanted gap between your teeth, and now the time has come to do something about it. The problem is you’re not sure what can be done to correct the problem. With the advances in dentistry, you now have some options to choose from, and as you continue reading, your cosmetic dentist weighs in to discuss them. One of the options you have for masking a gap between your teeth is the cosmetic bonding method. Your dentist will use a tooth-colored, composite resin material to reshape your teeth to close the space. Shade Selection – The process starts with your dentist using a shade guide to select the composite resin color that will best match your teeth. Etching – Next, an acidic compound is used to roughen your teeth so that the resin material will adhere properly. Resin Application – Your dentist will then add the putty-like resin compound and shape it to match your other teeth. Hardening – After the resin is applied and shaped, the compound is hardened using a special ultraviolet light. The procedure concludes with your dentist polishing your tooth, leaving you with a more aesthetically-pleasing smile. Another option you have for masking your gaps is to use porcelain veneers. These thin, wafer-like shells are made from high-grade porcelain to fit directly over your teeth. Enamel Removal – The first step is to remove a thin layer of enamel, so the veneers will fit properly over your teeth. 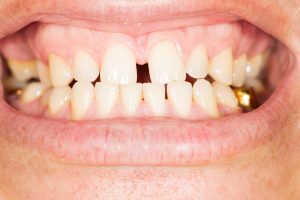 Bite Impressions – Next, bite impressions are taken and sent to a trusted lab that will fabricate your permanent veneers. Temporary Veneers Placed – While waiting on your final product, your teeth will be left vulnerable, so your dentist will fit you with a temporary set of veneers to protect them. Final Placement – After they’re ready, your dentist will invite you back to the office to be fitted with your permanent veneers, which will leave you looking and feeling like a million bucks! The more traditional route to take is to wear braces to close your gap. While the cosmetic options previously mentioned can mask an unwanted space in the smile zone, traditional braces provide a way to actually correct your bite. The treatment process is substantially longer, though. Whereas cosmetic bonding and porcelain veneers provide results in one-to-two visits, wearing traditional braces can take 24 months or more. If you’re looking to experience a better-looking smile in as short a period as possible, then reach out to your local dentist to start the process for a rejuvenated look today! 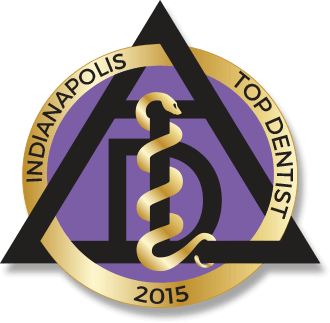 Dr. Mark M. Farthing is a graduate of the Indiana University School of Dentistry, and he’s been a fixture in the Indianapolis area for over 30 years. To better serve his patients, he has also received advanced education in occlusion (dealing with your bite) from the prestigious Dawson Academy. Dr. Farthing helps patients close the door on gaps at Indianapolis Family Dentistry, and he can be reached for more information through his website.